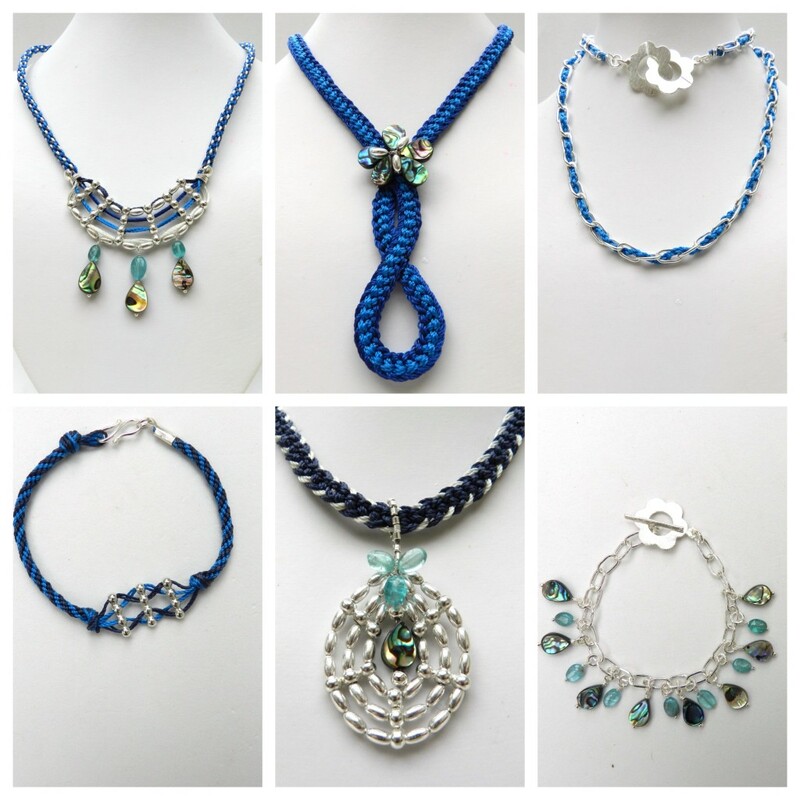 The second kit I demonstrated on Jewellery Maker on 20.5.15 contained no less than 4 reels of the thicker S-Lon (Tex 400), together with pretty abalone tear drops and aquamarine.There were also two types of spacer bar, very chunky chain and some shiny, silver rice beads. Spacer bars are not always easy to find, so some of these designs may not be easy to copy without the same materials. Other designs are more general and can be made with substitutes, as long as the thicker cord is used. To make a wide braid 2 cords per slot were used in Half Round Braid, with one colour in slots 32, 1, 9 and 24 and the other colour in slots 16, 17, 8 and 25. Use lengths of 1.2m. Coil the braid into shape and sew the braid together where it crosses to keep the curves in place. Use wire to make a flower with abalone and rice beads. Wrap the wire around the braid to keep it in place. Bind and glue the end of the braid. Pierce it with a decorative headpin. Thread a coil of wire or an end cap onto the headpin. Add a bead or spacer to cover the end of the coil and form a wrapped loop. Attach the clasp and repeat for the other side of the necklace. This was demonstrated on the show. 1. Cut 2 x 1.2m of one colour and 2 x 1.2m of the other colour. Find the midpoint and tie a neat overhand knot, leaving a small loop, which will be one side of the clasp. Position the cords on the disk and braid using the Round Braid instructions. When the braid is long enough apply a small amount of glue to the point of braiding and allow it to become touch dry. Remove the braid from the disk and tie an overhand knot to cover the glue. Separate the cords into 2s and thread them through the spacer bars, changing the position of the cords to make a criss-cross effect. At the end of this section tie another overhand knot. Return the braid to the disk and continue to braid for about 2cm longer than the first half. Bind, glue and trim the braid. Make sure the length matches the first half of the bracelet. Attach a fold-over ribbon end and S-clasp. 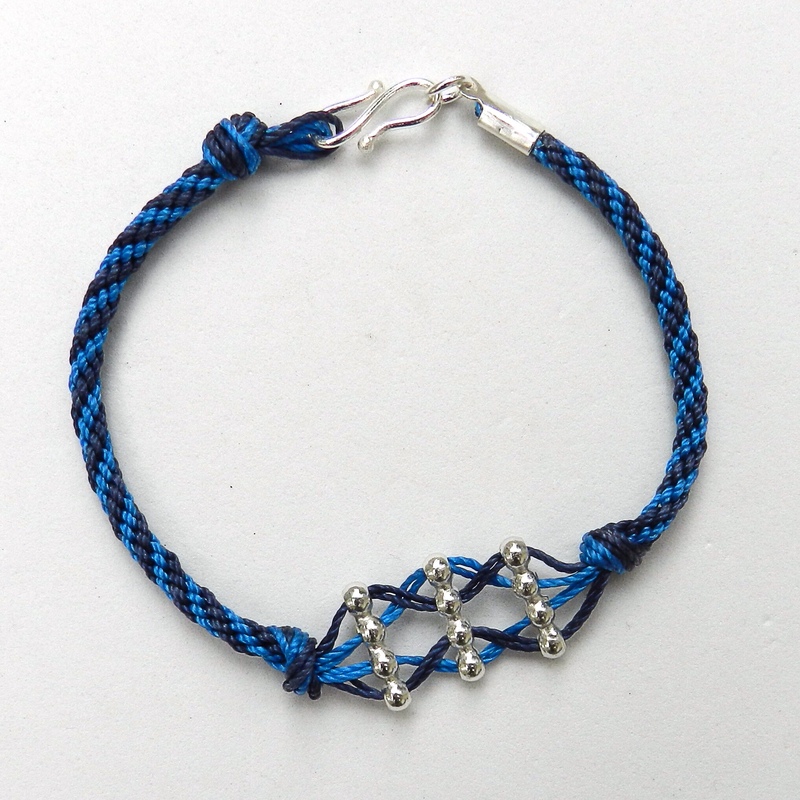 The braid is Half Round Braid, with 2 cords per slot and the contrast colour in slots 1 and 32. Use 1.2m lengths of cord. 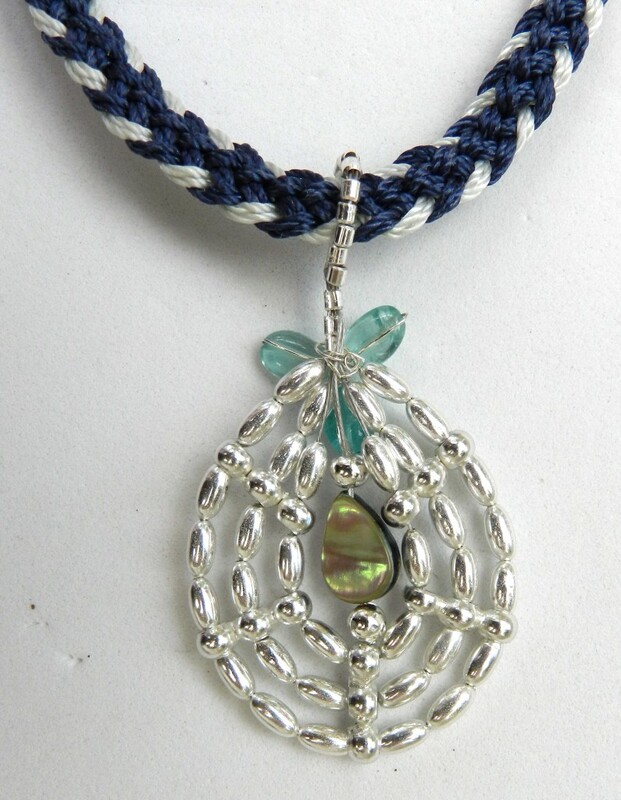 The pendant is made with spacer bars, rice beads and beading thread/wire. Thread on the materials as shown in the photo and then bring all the beading thread together in a crimp. Compress the crimp neatly with crimping pliers. Do the same with a second crimp for added security. Trim off 4 ends of beading thread close to the second crimp. Thread on approximately 13 crimps and bring the thread back through the first of these crimps to form a bail. Thread a crimp, an abalone and another crimp onto the two beading threads. Close the crimps carefully to position the abalone in the middle of the pendant. Add crimp covers. Use wire and aquamarine to make a small flower and attach it to the top of the pendant. This is the reverse view. This 4 cord braid was demonstrated on the show. I do not yet have instructions for it here on the website, so please refer to the recording of the show. Once the braid has been completed seal the ends with glue. Thread the braid through each link and attach it to the last link by piercing the braid with a headpin and wrapping the pin around the link and then into a wrapped loop. Attach the clasp with a jump ring.